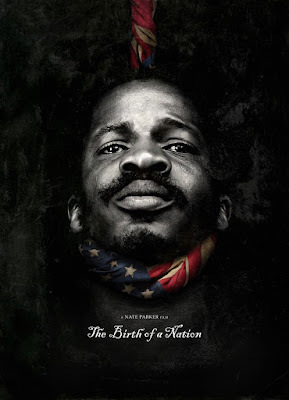 Nate Parker's Sundance Award-winning directorial debut The Birth of a Nation opens later this year when it's expected to be a major player in the Oscars race. It's also likely to be highly controversial considering the film centers on Nat Turner, a slave and fiery preacher who led a violent rebellion in 1831 Virginia. And now Parker has debuted a striking new poster with an image that is sure to stoke plenty of emotions considering today's current events. It's no secret I've been less unenthusiastic about this film's chances of winning an Oscar than some others, but it's not because I disliked the movie. Quite the contrary, I think it's a Hell of an achievement for a first-time director, but it's far from perfect. There's also a good chance that it's so confrontational it does more harm than good to its awards chances, which would be a shame but not out of the realm of possibility. These are subjects I brought up to Parker himself during my interview with him, so check that out here.